I tend to over-extend myself. Whether it is at work, or at home – I always think I can do more. I fill my weekends with activities (ok, my kids fill me with activities), and I try to fit in baking and cooking whenever I can. I can never say no to baking for auctions, or various events at my kids schools…I actually look for those opportunities – as much as I end up cursing later on. I signed up to bake for the “Dessert Dash” at an auction we are involved in last weekend. I didn’t want to just bake a cake, I wanted to do something different. I wanted to give people some choices, and some variety to choose from – knowing that 10 people bid on dessert – and they are stuck sharing one item. So – I decided to make a Dessert Tower – or what I called – The Tower of Treats. I bought a three-tiered cardboard cupcake stand, and filled it with various desserts (all of which I will be posting). Here is the first one – which I sprinkled in between the other goodies. 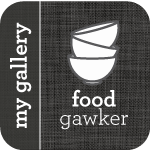 I found these delicious caramels at Annie’s Eats – I have always been afraid of the candy thermometer, but I faced my fears, and made these – and I am SO GLAD I DID. They were amazing – in fact, I am still enjoying them because the recipe made so many. 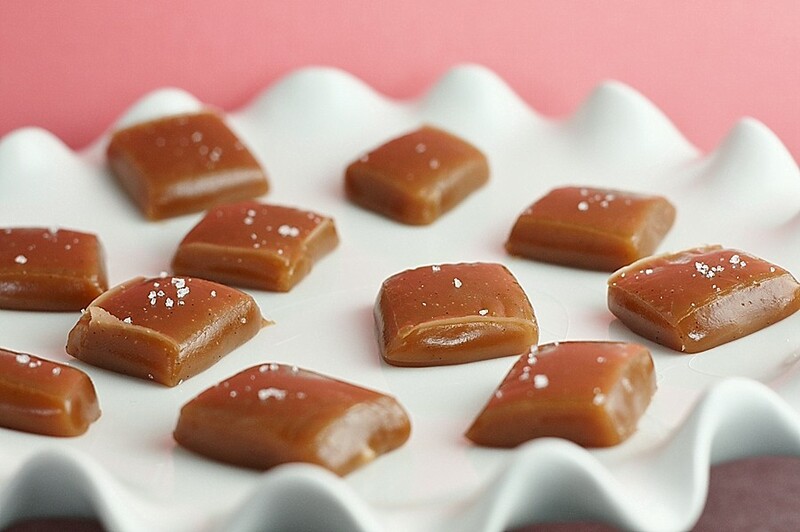 They are buttery and rich, and the subtle salt flavor is just amazing with that deep caramel. I couldn’t believe they were so easy…I am making these every holiday to wrap my pretzels before dipping them in chocolate. Wow, I have really been missing out – don’t waste another day…MAKE THESE NOW!!! Line the bottom and sides of an 8-inch square baking dish with parchment paper. Lightly butter the parchment. In a small saucepan, combine the cream, butter, vanilla extract, vanilla bean seeds, pods, and fleur de sel. Heat over medium-high heat and bring to a boil. Remove from the heat and set aside. In a medium saucepan, combine the sugar, corn syrup, and water. Heat over medium-high heat, stirring occasionally until the sugar is dissolved. Boil, without stirring but gently swirling the pan occasionally, until the mixture is a light golden caramel color. Remove the vanilla bean pods from the cream mixture and carefully stir the cream mixture into the caramel – the mixture will bubble up, so pour slowly and stir constantly. Continue simmering the mixture until it registers 248˚ F on a candy thermometer. Immediately remove from the heat and pour into the prepared pan. Let cool for 30 minutes, then sprinkle lightly with additional fleur de sel. Continue to let sit until completely set and cooled. Cut into 1-inch pieces (a buttered pizza cutter works well). 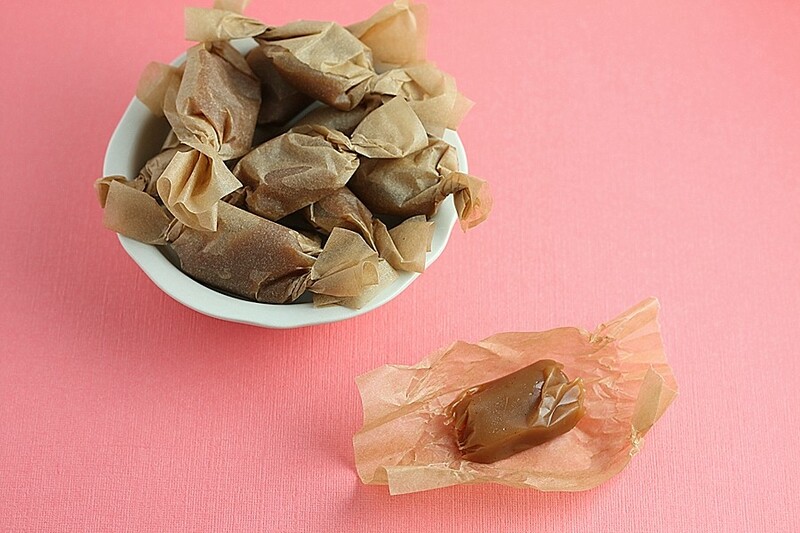 Wrap the individual caramels in small pieces of wax paper, about 4-inch squares. Yeah! My only attept using a therm wasn’t so great, so will try again with these! I want to see pics of the Tower of Treats! I can tell you that the Tower of Treats was amazing. My table bought it at the auction, and we all feasted on the caramels, truffles, brownies and cupcakes. Even took a few home to savor later. those DO look wonderful, Dawn! you weren’t a-kiddin’! this would be such a fun holiday treat! way to go on conquering your fear of a candy therm…i don’t even own one i’m that scared of them! These look fantastic! Just one question: what prepared pan? Sorry – I forgot that part, but just added it in.